A wreck-site can be visited regularly by scuba divers yet still warrant proper archaeological investigation, says the USA’s National Oceanic & Atmospheric Administration (NOAA). Following yesterday’s news story about NOAA’s experimental scans on a group of wrecks off Rhode Island, the organisation’s Office of National Marine Sanctuaries has released information about two underwater surveys it carried out further south on the US Atlantic coast this summer, off North Carolina. The state’s Outer Banks have been dubbed “the Graveyard of the Atlantic” for the many shipwrecks that have occurred there, especially during WW2, and are the location of the Monitor National Marine Sanctuary, which in 1975 became the USA’s first marine protected area, named after a Civil War wreck. The wreck survey expedition formed part of a proposal to expand the sanctuary. 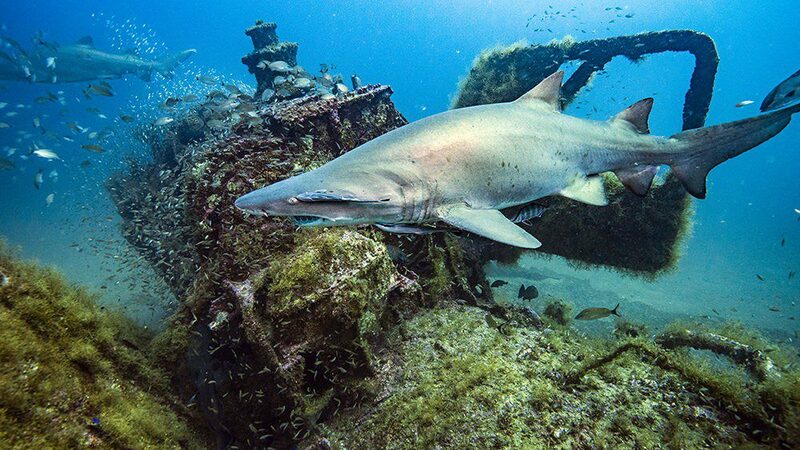 The submarine USS Tarpon and the passenger liner Proteus are both popular dive-sites in this tourist area, says NOAA, especially as they are havens for marine life including sharks, but neither wreck had previously been documented by maritime archaeologists. USS Tarpon was operated in the Pacific theatre throughout WW2 from within two days of the Pearl Harbor attack, sinking several Japanese vessels and becoming the first US submarine to sink a German raider ship in the Pacific. The vessel was decommissioned after the war to be used for training, then sold for scrap in 1956, but before it could be broken up sank while under tow off Cape Hatteras, to its present depth of just over 40m. The luxury liner Proteus carried passengers between New York and New Orleans from around the turn of the 20th century, continuing to do so through most of WW1. On August 8, 1918, she was heading north with all lights off according to anti-submarine protocol when she collided with the also-unlit tanker Cushing. All but one crewman was rescued. The wreck lies at a depth of around 35m. Surveying the two historic wrecks for the first time, divers documented their current condition while marine biologists conducted wildlife-density studies and fish-counts. Both single- and multi-beam sonar scans were carried out and combined with the divers’ photographs to create a photogrammetry model of Tarpon, which can be viewed here. The expedition was supported by East Carolina University, the National Centres for Coastal Ocean Science, NOAA Fisheries and NOAA’s Restoration Centre.